The traditional July 14 parade on the Champs-Elysées promises to be especially grandiose this year – on a day which will also see President Macron jetting down to Nice to continue the ceremonies there. Both cities are also marking commemorations – with US President Trump in Paris for the 100th anniversary of the USA joining the First World War, while Nice has a special programme marking one year since the terrorist attack where 86 people died. Almost 4,000 servicepeople and 240 horses for the Republican Guard will be taking part in the parade in Paris, which starts at 10.30. From 10.00 Mr Macron will be meeting with Mr Trump. A total of 145 American troops will be among those taking part in the parade, notably from US Air Forces Europe, US Naval Forces and US Marine Forces Europe. The parade ends at 11.45 after which President Macron will leave. Music is then the main attraction, with the Orchestre National de France and the Radio France choeur de la Maitrîse choir performing a concert at 21.00. There will then be half an hour of fireworks from the Eiffel Tower to music including the theme from the last Star Wars film, The Force Awakens; la Chanson des vieux amants by Jacques Brel; Catgroove by Austrian electro swing pioneer Parov Stelar and I Love You by French artist Woodkid. At Nice the city is organising a ‘participative homage’ to those who died in last year’s attack, whereby during the day people may go to the Quai des Etats-Unis at the end of the Promenade des Anglais and place blue, white and red plaques, which will reveal a giant-sized message at 20.00. The message was chosen by the victims’ families. 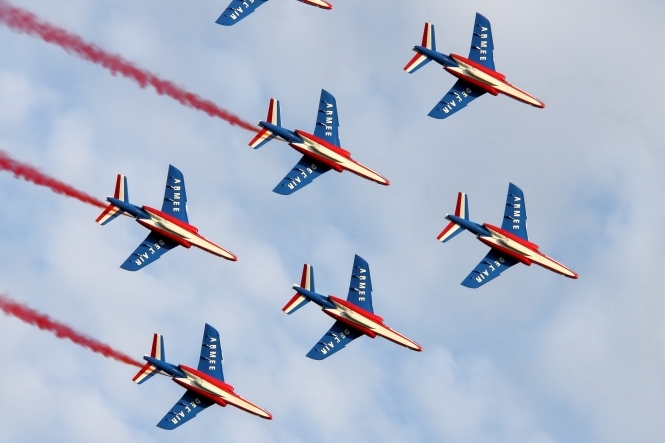 President Macron will attend the parade at 16.30, which will include participation by the Patrouille de France air display team. It will be followed by a homage by the mairie in Place Masséna which will also be shown on a big screen in the Promenade du Paillon / Coulée Verte area. At 21.00 there will be a concert with the Orchestre Philharmonique de Nice and the choir of the opera, then at 22.34 there will be a minute’s silence followed by a light display on the Promenade des Anglais with music called les feux d’artifices – but no actual fireworks. In fact no firework will be let off at any official celebrations in the Alpes-Maritimes department on July 14, in honour of those who died last year just after the usual July 14 display. As usual, there will be other celebrations around France, including the traditional bals des pompiers (firefighters’ balls) in fire stations.